Thanksgiving conjures images of pumpkins, the perfectly cooked turkey on a beautiful platter, colorful leaves, and the family gathered around a table groaning with food. We create our traditions and enjoy our families in this country that has been free for over 200 years. I pray it stays a free country. I believe that God has us in the palm of His hand and nothing that is happening is a surprise to Him. This year I created a Thanksgiving vignette using gathered elements. 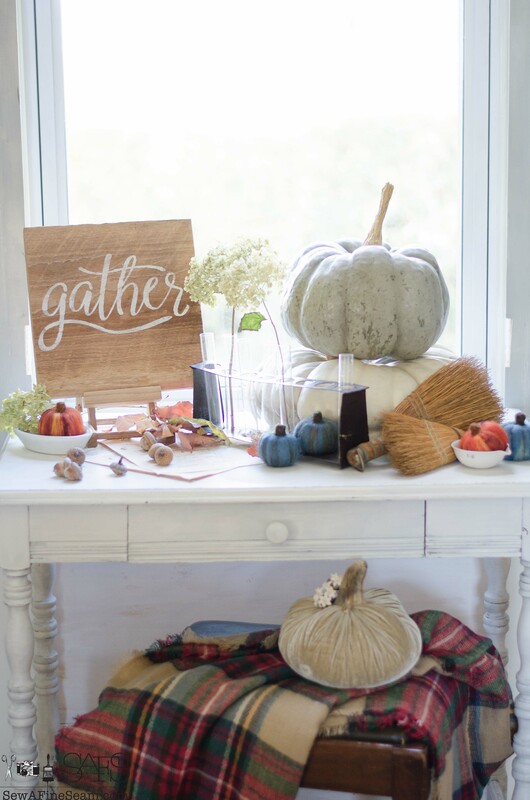 I pulled together some favorite things including leaves and acorns, pumpkins both real and faux, old papers, and a painted gather sign. 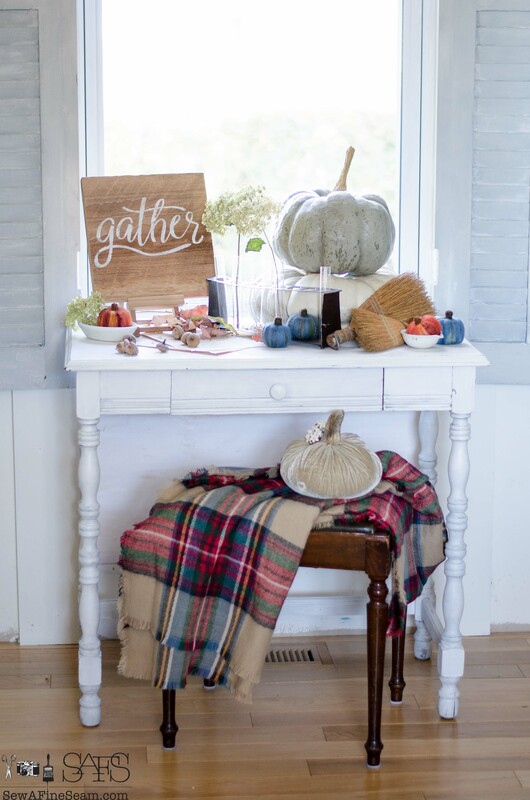 Adding a plaid blanket scarf and a velvet pumpkin to the stool was just what this little space needed to finish it off. I picked up several of these fun blanket scarves last fall. I don’t think I’ve worn a single one of them. 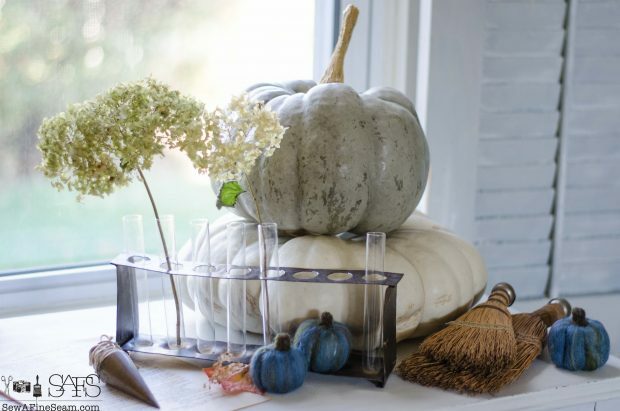 They get used for decor instead, adding fun pops of color throughout the fall and winter seasons. To create my vignette I started by gathering together a mix of things I love and wanted to use. I didn’t end up using all of them, but that is part of the fun of creating a vignette. Editing, adding, removing till it’s just right. These totally adorable, felted wool pumpkins were made by my neighbor and I’m so in love with them! She sells her creations at Smith Merchants, her signature item right now being handmade wool dryer balls. My real pumpkins came from Holmes County, Ohio. They have lasted so well I may have to make it a tradition to head up that way for my pumpkins every year! My youngest daughter made me a couple small bouquets of leaves when they first started falling this season and I had tucked them on a shelf. I was glad I had them when I started creating this vignette, as they add a touch of nature. My Family. My business and all those who have loved my handmade products and supported me so well. That I live in a country that allows me to have my own business, do what I love and share it with all of you. I pray it stays that way. I am thankful for Autumn – and especially this year that it has been so awesome and the weather so warm so long. I’m thankful above all for Jesus and the Father’s salvation plan. 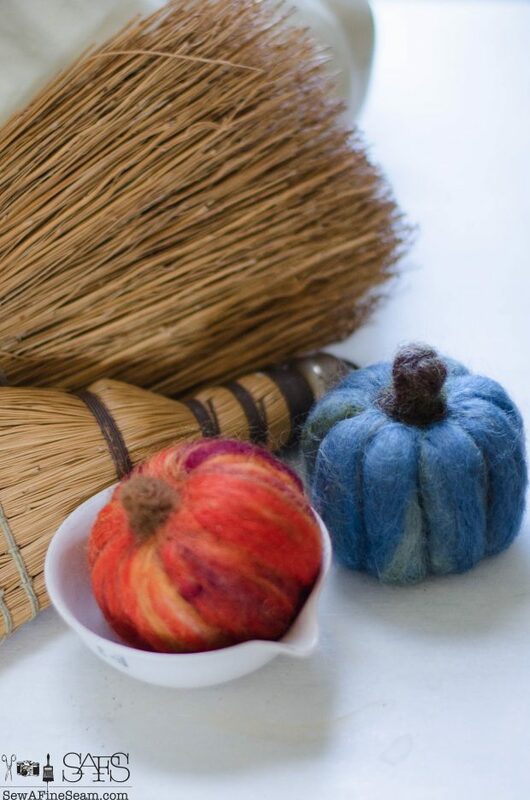 Seriously these wool pumpkins! Have you ever seen anything so cute? 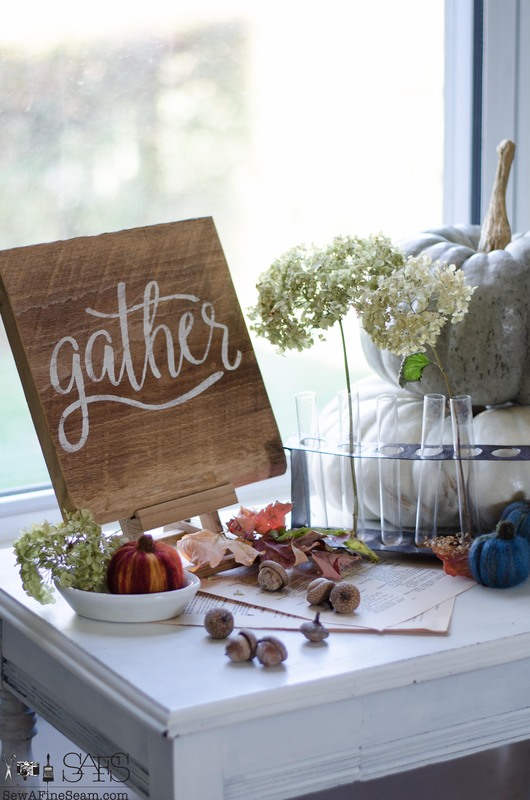 I made the gather sign myself – wood signs using the same designs I use on my pillows were added to the mix over a year ago. They have been a fun addition and mix well with my brand. 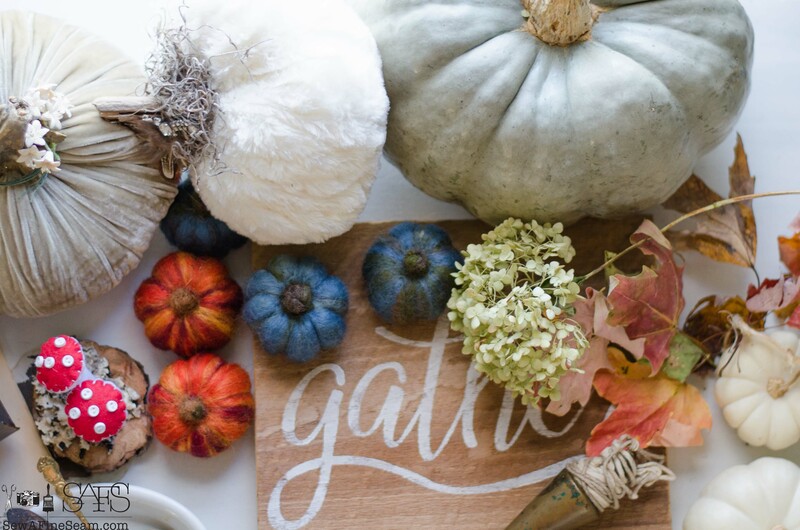 I’m not the only blogger who had fun creating a thanksgiving vignette – I join some blog friends who are sharing their decor skills and I know you will want to go check out what they have to share! 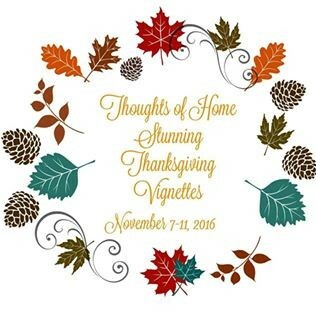 Everyone is invited to join the Thoughts of Home on Thursday Thanksgiving Edition Linky Party. Oh my dear friend I am completely enchanted! Those wee felted pumpkins your neighbor makes are simply adorable. I smiled truly wide when I read how you possibly haven’t worn a single blanket scarf but my oh my can you decorate with them. 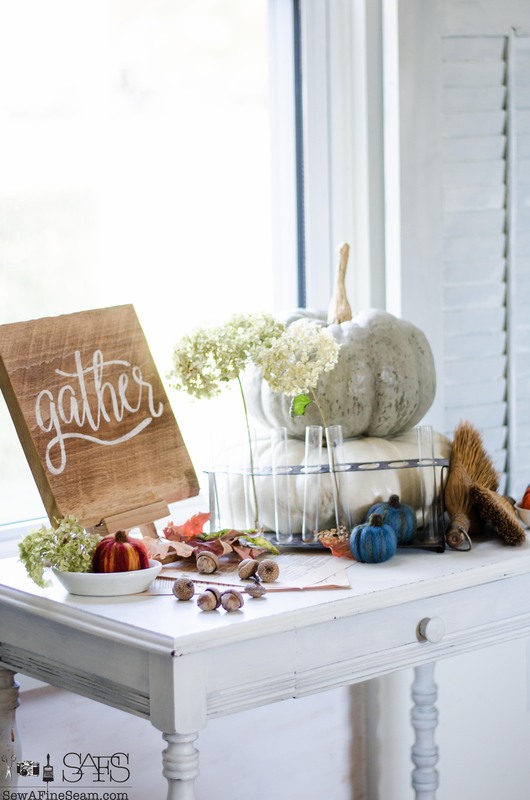 Thank you Jill from the bottom of my heart for adding such a lovely vignette to our Thanksgiving Vignette gathering. Oh Laura, you are the best! Thank you so much for including me in this tour with such amazing bloggers – I’m truly humbled! Oh what a gorgeous vignette you have put together. Love it all. Thank you Jenna – may your family be blessed abundantly this Thanksgiving season! Stunning fall vignette Jill, those little yarn pumpkins are such a wonderful detail. I just love it! So happy to be paired with you on this amazing fall tour! Thank you Christine, I’m honored to be included with all of you! It’s a beautiful day in American and I love what you did here. The plaid was also the perfect element of surprise. Jill this is so pretty! 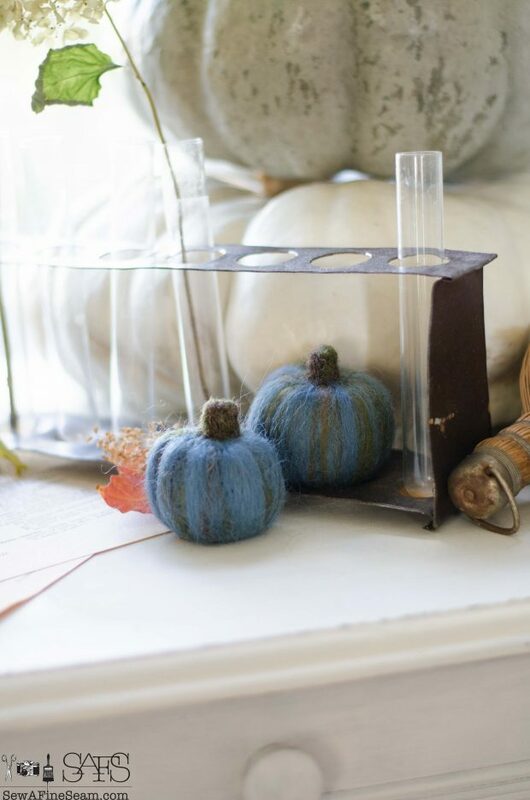 The little wooly pumpkins are perfect with their beautiful colors. 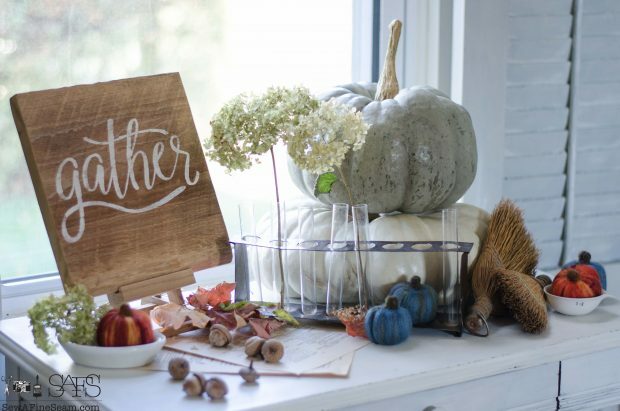 Love how you combined your sign, the hydrangeas, and the pumpkins. Thank you so much Stacey – I have quite the collection of faux pumpkins of all different types and sizes now – so fun to add to the collection every year. My smartphone is forever changing love to live. Or I hit i instead of o.
Ha-Ha! I do this all the time too! I am so happy to have connected with you through this tour. I have been inspired by you for some time. Your love of family and faith reflect in all of the beautiful things you create. 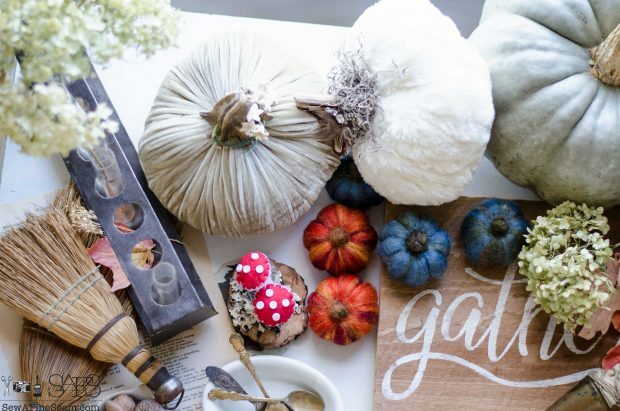 Each detail of your Thanksgiving Vignette is pure joy. I love how you have shared the meaning of the season too. Thank you so much Jemma! I’m excited to be a part of this – everyone has such beautiful things to share! Oh Jill, those are the most adorable fuzzy little pumpkins I’ve seen this Fall! Your Thanksgiving vignette is so pretty. The sign, the scarf, and yeah, that old plumb bob.. Love it! Thank yo Cristina – I think my friend who made the pumpkins needs to open up an etsy shop! 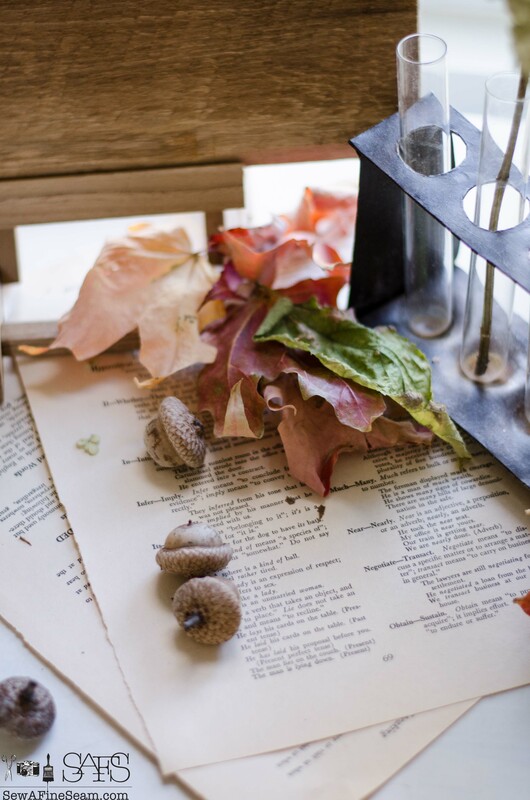 Your Thanksgiving vignette with items from autumns bounty tells a nice story about you and your values. Love the plaid scarf tucked on the stool. I couldn’t help but notice your table that holds your vignette. So cute and an ideal size that would fit in a lot of places.I think I have one just like it. Was it perhaps a small desk at one time with a pencil holder on the back? Wishing you a Happy Thanksgiving. Thank you Bonnie! The desk doesn’t appear to have had a place for a pencil holder but it does have a place inside the drawer for an ink well! Your Thanksgiving vignette is so beautiful and heartwarming, filled with a genius mix of velvet and real pumpkins, acorns, leaves, papers, and the last of the hydrangeas. 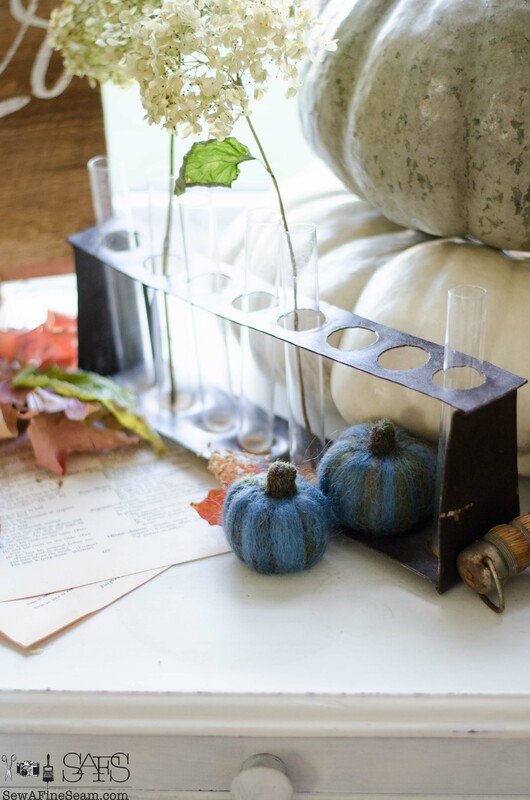 Love the test tube vase! 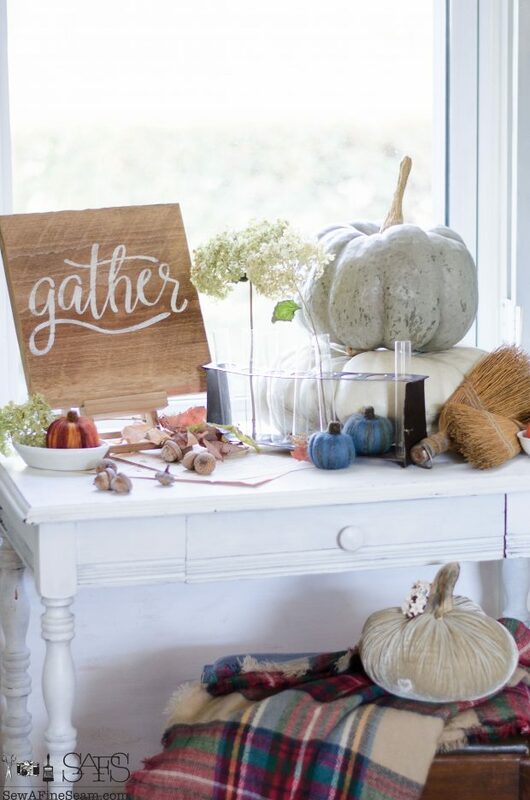 Your Gather sign says it all about this magical time of year, and you have gathered a feast for our eyes. So thrilled and honored to be playing with you today! Thank you so much 🙂 I had fun putting this together. It was great to be a part of this with you! So soft and lovely! I love all the colors and textures together!! Thank you Susan! Happy Thanksgiving! So happy to get your post so if I missed any forgive me. Haven’t quite been myself since losing our grandson but working on dealing with his loss. Your vignette is so special. As others commented, reflects you as a person, it’s beautiful. Did you get scarves at Target? I was going to get one then got distracted and forgot to buy one for decorating. Now they’re all gone, dog gone it. Have been picking up plaid napkins, one small table runner whatever can find can use for holidays, thank heavens for thrift stores. Now there’s something to be grateful for besides many bloggers like yourself have “met” on blog land. Every item on your vignette is perfect, looks so casual and very sweet. Hope your family is doing very well,girls growing up before your eyes.Your business is flourishing. Our chickens are laying again, guess they thought they needed vacation. Hi JaneEllen – I doubt you missed any posts. I pretty much took the summer off from the blog. My handmade business is taking most of my time these days! I do miss the blog and all the friends I have made through it. I hope to get to a schedule of posting once a week once we get through the holidays! Thanks so much Sheila! I love how this vignette came together! You created such a warm and inviting spot by the window, Jill. Loving your use of so many natural elements. And the plaid throw is fabulous! 🙂 Thank you Mary Alice, I love uisng plaid whenever I can in the fall and winter! 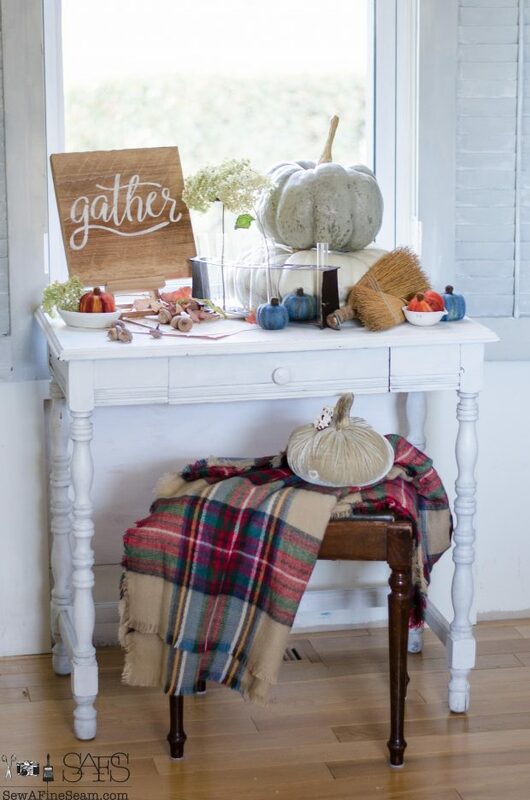 LOVE you colorful pumpkins…and that plaid throw has the perfect colors. Beautiful vignette! Aren’t the pumpkins wonderful?! I’m so glad my neighbor was able to make me some! Have a very happy Thanksgiving! 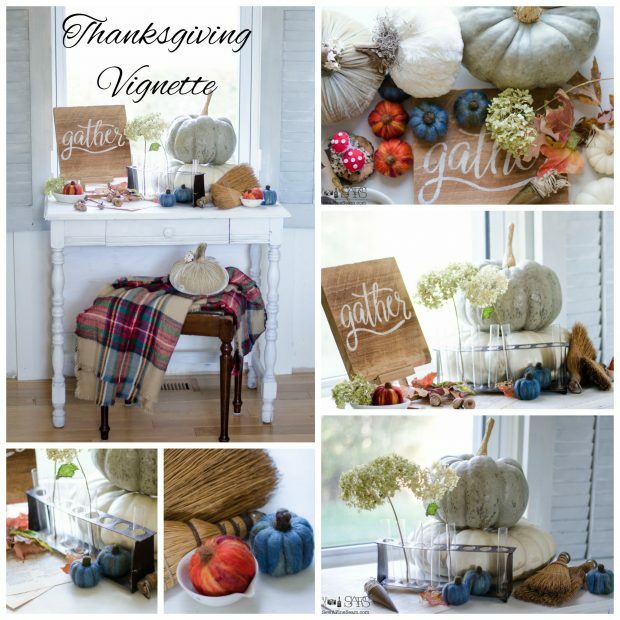 You have created beautiful Thanksgiving vignettes Jill. Thank you so much for joining us on our tour this week. Thank you so much! I’m honored to have been a part of this group of talented bloggers! Happy Thanksgiving! 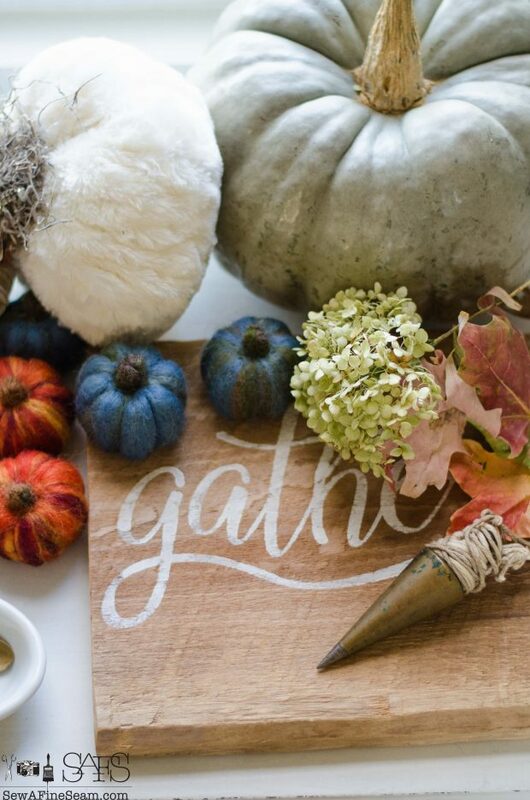 Loving your gather sign and those wool pumpkins are darling. 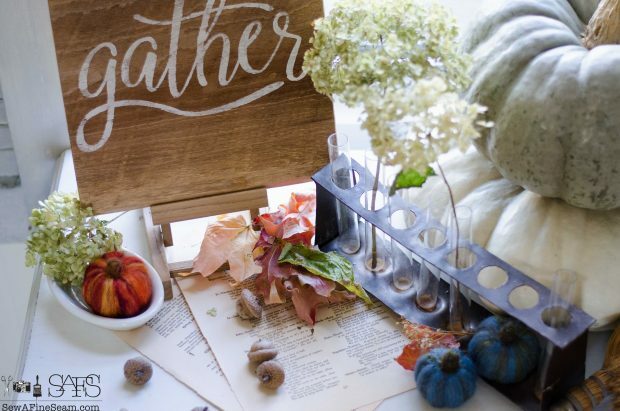 Truly a lovely thanksgiving vignette to enjoy and share. Have a lovely weekend. Thank you so much Linda, have a wonderful Thanksgiving! Thank you so much Maria – those blue pumpkins are my fav! 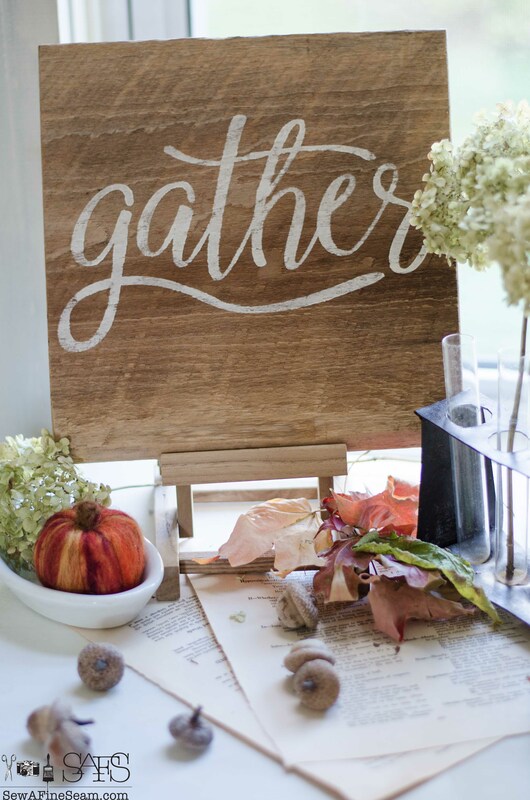 I love the Gather Sign, I have a ton of wood left over from my home construction that is vintage. Thank you Maria! What fun to have a stash of vintage wood to create with!